Anytime you are responsible for children, guidance issues will come to the surface. The Latin word for discipline is “discipulus” which means student or pupil. In other words, you are teaching children what type of behavior you want. The most effective form of discipline is to use positive reinforcement when children are behaving properly. The best way to get a child to repeat unwanted behavior... is to make a big deal out of it. As a child care provider your job will always involve guidance issues. Stay calm, keep things simple and the children in your care will learn correct behavior without a lot of effort. When dealing with very young children, there is really no such thing as guidance issues. Teaching a very young child involves more redirection than anything. Simply removing them from the situation and giving them an alternate activity solves the majority of problems. Here’s the basics of what I use in my in-home daycare. For the most part, guidance (over the age of 2) involves taking privileges away. For example, if a snack is purposely thrown to the floor, the child loses the snack. I strive to keep everything as low key as possible. A simple “snacks do not belong on the floor”; while I’m removing the snack is enough. I try not to give any real attention to poor behavior. If a child is throwing a toy not meant to be thrown, they lose the toy. I want the privilege taken away to directly correlate to the poor behavior I want stopped. I will also want to take something away that is immediate. A young child throwing a toy in the morning… being told he will not be able to participate in the afternoon movie will not be able to connect the behavior to the consequence. And, most important of all… I stay consistent. Meaning a child will lose their snack every time it is thrown to the floor. They don’t get chances to try again during the same snack time. Trust me when I say, it typically won’t take more than a few times before the child connects throwing the snack with not having one. The younger the child, the more immediate I need to be in my actions. Say I am having animal crackers as part of our snack. I won’t wait until the fourth cracker lands on the floor to do something. If I wait… the child learns that he can sometimes get away with poor behavior. There will always be guidance issues in daycare bigger than throwing a snack to the floor, and all providers need to wisely choose their battles. Beyond taking away privileges, some behaviors will (and should) result in using a time-out. In my home daycare, I use the one minute per year of age of child rule. Meaning a three year old gets three minutes. I chose two or three types of behavior I will not tolerate that will result in a time out. And I use it consistently… and seldom. 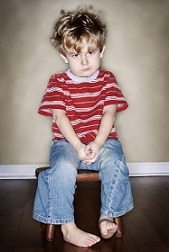 If time-outs are overused for many types of behavior problems, they tend to lose their effectiveness. The time-out chair should be in a boring place but in a position where you can easily see the child. Should I find myself in a position where the child does not want to stay in the time out chair, I lead them gently (but firmly) back to the chair, and I reset the timer. Once a child understands that I’m not backing down, generally they will handle the timeout (and any other timeouts) without further problems. One example of an immediate time-out that comes to mind is hitting. Should any child physically hurt another child in my daycare, there is an immediate time-out. I will talk to them afterward, but even then I keep it low key. Strive to look for good behavior to praise, and as much as possible do not give attention to poor behavior. Handling guidance issues in this way has resulted in very few problems in my program.